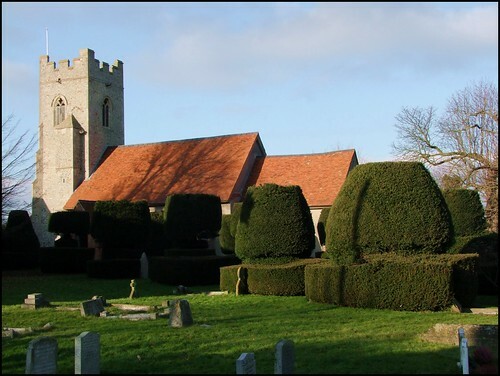 Borley is a tiny hamlet not far from the high street of the large Suffolk village of Long Melford, a quarter of a mile from the Suffolk border and entirely a Suffolk church in style and setting. It became, in the 1930s, the focus of notoriety thanks to the activities of a conman and self-proclaimed 'ghost hunter' called Harry Price. Price elaborated on the hoaxing and spoofing of the successive Rectors and their families of the time. As a result of his books, Borley Rectory became known as 'the most haunted house in England'. The hokum and fakery still attract a lunatic fringe of sensation-seekers with nothing better to do, and hence the church is ordinarily kept locked, unusually for north Essex. An unlikely knock-on effect of the events at Borley was what happened at nearby Middleton - one might even imagine there was something in the water around here which led to such shameless self-delusion. In We Faked the Ghosts of Borley Rectory, Louis Mayerling - for whom the house was a second home until its destruction by fire in 1938 - reveals for the first time how the 'hauntings' were created by the rectory's various inhabitants. He describes how they watched in amazement as the world fell for the elaborate hoax. An investigation carried out by the BBC the year before the fire, when Mayerling was 26, noted more than 2,000 incidents of paranormal activity and concluded that the hauntings were true. The Most Haunted House in England, a book by Harry Price, the most eminent psychical investigator of the time, who lived in the house for a year, cemented the rectory's position as the best documented case of haunting in the annals of psychical research. 'Harry's book became a sort of bible and foundation of knowledge to the thousands who, in that age of psychic phenomena, were keen to believe,' said Mayerling. 'Before long, Borley Rectory stories were practically a daily occurrence in the London newspapers: at the height of it all, we were visited by dozens of coaches packed with ghost-hunters each day. People were coming from as far away as America. 'I would love to say that there was a grain of truth in it all, but I felt that the book had to be written to reveal the farcical truth about the house - as personally experienced.' George Bernard Shaw, T.E. Lawrence, Sir Montagu Norman, Governor of the Bank of England, and Bernard Spilsbury, the Home Office criminal forensic scientist, were firm believers in the hauntings and attended séances at Borley. Even now, belief in the hauntings has remained so powerful that the case is still held up by believers as incontrovertible proof of the supernatural. Britain's fascination with Borley peaked in the Thirties, when the Rev Lionel Foyster took over the parish with his wife Marianne. Foyster found it hard to survive on his church stipend of £6 a week, and he and his wife decided that boosting the ghostly reputation of Borley was the best way to make ends meet. Mayerling, who had returned to live in the house with the Foysters, tells how the couple installed a new water heater which emitted heavy knocking sounds and proclaimed themselves horrified by the noises, and pitted the skirting boards with phosphorus powder which catches fire when exposed to the air. The couple encouraged Mayerling, still just a teenager, to walk the gardens at dusk in a black cape and turned-up collar - giving birth to the myth of a headless monk who took to writing cryptic messages on the walls of the house. The real ghosts of Borley, of course, are the Waldegrave family, lords of the manor in late medieval times, and memorialised in wide-eyed terror in effigy on their rustic tomb of about 1600.